On a bitterly cold December night in 1971, a bomb was placed in the doorway of the tiny Tramore Bar in Belfast, Northern Ireland. As the fuse burned, friends and neighbors inside chattered happily to the owner of the family-run bar, Patrick McGurk, whose surname the bar was more commonly known by. Upstairs his wife Philomena and the couple’s only daughter Maria had just returned from confession at St. Patrick’s Church. The banter that night was typical of McGurk’s customers, who were more interested in a “pint and a punt rather than the sectarian politics of the day.” But as these elderly friends and neighbors chattered about their Christmas shopping, a flash of light and an ear-splitting noise preceded a horrific scene of blackness, breathlessness—and death. Fifteen innocent men, women, and children died in the ruins that night. The oldest victim was 73, the youngest just 13. None had any known links with the IRA. They died from horrific injuries as the roof and walls caved in to crush and suffocate them; as leaking gas ignited, many were horribly burned. One of those who died was 53-year-old Kathleen Irvine. Kitty—as her family knew her—was author Ciarán MacAirt’s grandmother. This was an era widely known as The Troubles, though a more appropriate definition might have been guerrilla civil war between paramilitary groups of Loyalist Protestants (including the UVF and the UDA), and their Catholic Republican counterparts (including the IRA and PIRA). Into this maelstrom the British government pursued various policies typically used in war, including disinformation, to further their end goal. Colin Wallace, who has written the foreword for this impressive book, was a member of the British Army’s covert psychological operations unit counting among its specializations the passing of disinformation into the public domain. Despite eyewitness accounts confirming the bomb was planted by Loyalists outside the bar, and forensic evidence to support this, the authorities began a systematic program of laying the blame squarely on the victims’ shoulders by claiming the bomb had exploded prematurely in the bar before its scheduled deployment by the IRA elsewhere. The aim was to steer public opinion against the IRA and shield the Loyalists’ guilt. The tragedy for the families and friends of these innocent victims was only just beginning; their lost loved ones were publicly branded as terrorist sympathizers at fault for their own deaths. A man of his word, he has accomplished research establishing a detailed and proven paper trail that finally reveals the truth. 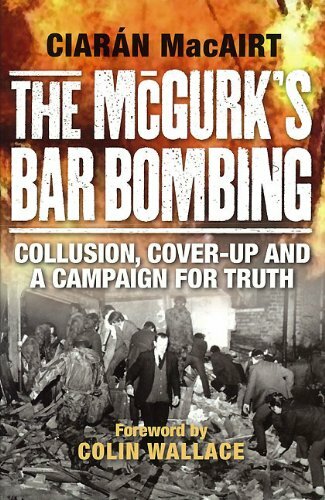 The culmination not only of seven years of research on his part, but also a dedicated fight by the families for the truth, the revelations in The McGurk’s Bar Bombing are all the more shocking when considered in the light of other recent admissions of British collusion with Loyalist paramilitaries. The murders in 1975 of three musicians from The Miami Showband pop group and in 1989 the murder of Belfast solicitor Pat Finucane, are but two examples. Greek dramatist Aeschylus claimed, “In war, truth is the first casualty.” Yet thanks to determined writers like Mr. MacAirt the truths behind this particular tragedy have been resurrected.